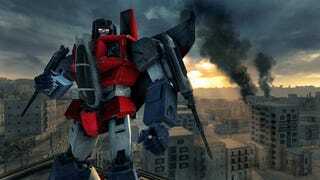 A downloadable expansion pack is in the works for Transformers: Revenge of the Fallen which will include ten new characters, three new maps and a new difficulty mode, Activision announced this morning. The Playstation 3 and Xbox 360 pack, which is being developed by Luxoflux, hasn't yet been priced. More than ten new multiplayer characters including ultimate fan favorites such as G1 Starscream and movie favorites like Sideswipe. Play new characters in both the Autobot and Decepticon single player campaigns. New Expert difficulty mode with a fresh set of leaderboards to challenge more experienced gamers in the single-player campaigns. New Achievements and Trophies to earn.